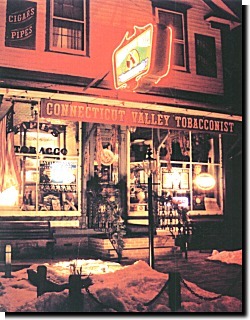 Connecticut�s fabled tobacco tradition, once nearly lost to the dusty leaves of history books, is alive and well at Tobacco Valley Cigar Company, thanks to the creative efforts and foresight of proprietor Michael Tarnowicz who draws from the past to create smokes worthy of the future. Combining local, as well as some national history, Michael Tarnowicz has parlayed his love of cigars into a thriving retail shop and manufacturing presence - creating a modern demonstration of Yankee ingenuity. The Tobacco Valley Cigar Co. is located deep in the heart of Connecticut�s fabled leaf-growing region, known for its legendary shade and broadleaf. It�s also about 20 miles north of the capitol, Hartford, giving it distinction of being the northernmost tobacconist in the state. By the other direction, it�s about ten minutes south of Springfield in neighboring Massachusetts - providing it with a deep population base - much of it affluent, to build a thriving retail business. By his estimates, there are about three-quarters of a million people within a 20-mile radius of the store. Established in 1996, the shop (a.k.a. Connecticut Valley Tobacconist) marks the beginning of a new chapter in the life of owner Tarnowicz, whose very first job was that of tobacco picker at the age of 13. �My dad decided I should learn how to work that summer,� he explains. In those days, his pay was based upon how much he picked and, during a good week, reached as high as $100. He�s gone from picker to purveyor to creator of blends and brands. Along the way he worked as a tobacco broker and a reseller of used exercise equipment before his �real job� took hold - a purchasing manager for a major defense contractor. But a mid-life layoff forced him to look for new opportunities and tobacco inched back into his life. Always possessing an entrepreneurial nature and strong desire to be his own boss, Tarnowicz began studying the possibility of opening a tobacco shop. A local pharmacy that had sold cigars for many years went out of business. A few other retailers followed in the same space but none took root. When the space became available, Tobacco Valley Cigar Co. got its chance to blossom. Local history was in its favor. Owner Michael Tarnowicz extended the Civil War theme to several national brands. Being an American history buff (he collects Civil War memorabilia) has helped him in other ways. In an industry where creativity in marketing is often lacking, he regularly draws on Civil War themes to create and help name his cigars. �The Powder Keg brand was designed to capture the flavor of the area�s history,� Tarnowicz says. The Old Powder Keg line features a Honduran-grown Corojo Jalapa wrapper and includes Churchill, Torpedo, Robusto, Lancero, and Corona sizes. Introduced at the last RTDA in a shared booth, they drew praise for both the quality of the smoke as well as the packaging and reasonable pricing. Capitalizing on the brand�s popularity, a 60-gauge Powder Keg model is on the drawing board as is a 10-cigar gift box for spring delivery. All have stand-out appearances and the products deliver what they promise, competitive prices and a style all their own. In a nod to modern times, the store does take all major credit cards, has a toll-free telephone line and a website (www.battlegroundcigars.com). And while it�s open seven days a week, you will not find contemporary displays for tobacco products - no Marlboro Man. �There�s a reason people driving through like to stop in for their �annual visit,�� says Tarnowicz. In today�s fast-paced world of deadlines, cellular telephones, and overnight deliveries, he may be right as he�s sold some 30,000 cigars since the RTDA. And while sales for the privately held enterprise are not disclosed, he acknowledges that business has increased every year. Tobacco Valley had been selling directly to retail accounts but recently has aligned with representatives covering all major geographic regions of the country to help introduce the lines to retailers. Staff consists of two full-time and two part-time workers and they also sell humidors, lighters, a full range of pipes, pipe tobacco, and other accessories. The large majority of customers are men, but women can be seen buying refills for husbands and purchasing flavored cigars - often for themselves - in cherry vanilla, mocha, and berry. Creativity in d�cor and in branding, as well as blending, has helped but so has an ability to anticipate trends that may drive industry growth. 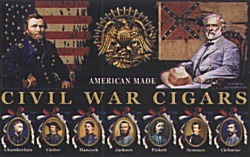 Similar to Powder Keg, Tobacco Valley launched Battleground Cigars, which commemorate leading Civil War personalities from both sides of the Mason-Dixon line. The Union is represented by Generals Grant, Custer, Chamberlain, and Hancock. Lee, Cleburne, Stonewall Jackson, Picketts, and Adm. Semmes the Alabama Raider make up the Confederacy. These all-natural cigars come in a hot-stamped cellophane wrapper displaying an artist�s rendition of Civil War era sword etchings. The Union cigars read �U.S.,� while the Southern ones read �C.S.A.� - Confederate States of America. Battleground cigars feature five-year-old Connecticut Shade wrapper, as well as Maduro and Connecticut Broadleaf. A full-bodied line extension sporting a Confederate-based name is under consideration. But as Tarnowicz is �very selective� in purchasing tobacco, as well as in the design process of his products, it�s safe to say the process will not be rushed. Since the brands were taken national, demand can no longer be met by the store�s single roller, so both Old Powder Keg and Battleground are co-manufactured in Nicaragua. All packaging is completed in Connecticut, featuring the artwork of oil painter Ken Hendricksen. A life-long resident of Maine, Hendricksen has specialized in recent years on Civil War themes, often working from historical photographs in a highly realistic style. Cuban-born Walter Pena (left), rolls cigars on the spot inside the store. At a 1991 trade show in Florida, Tarnowicz had been working side-by-side with a Cuban-born roller who spoke little English. One day, the roller passed him a note in Spanish. 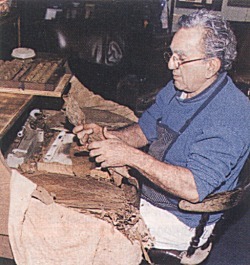 Tarnowicz later learned that the roller wanted to move to Connecticut and did he need someone to make cigars? Recognizing an opportunity to take his operation to another level, Tarnowicz got to work on the idea. Walter Pena, who came to the United States on one of the infamous Cuban boatlifts of the 1980s, soon got his ticket north and Tobacco Valley entered the exciting world of hand-made manufacturing. New lines were born and history was revived. �People want rollers,� Tarnowicz says. He credits this move with helping drive the business from a totally retail one into manufacturing. Today the store supplies rollers to special events, such as weddings and corporate affairs. It�s also a plus, he�s found, to have a roller working in the shop window, it excites people�s curiosity levels to see things made with a caring hand. Maybe it helps make them pause to dream of a day when time wasn�t the most precious commodity. Or maybe it helps them to see that with a few turns of a knife and some nimble fingers, a person could turn a drab agricultural product - a tobacco leaf - into an object of pleasure. At Tobacco Valley Cigar Co., taking a slice out of time has been the ticket to success.